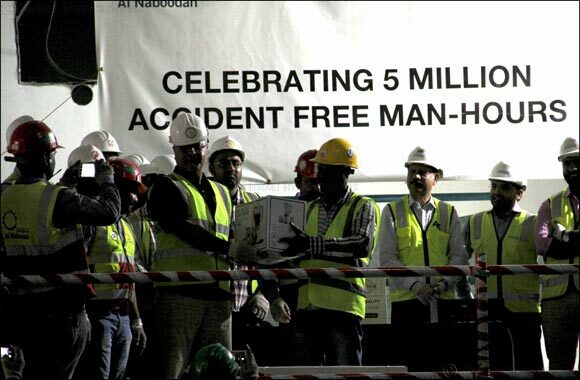 Dubai, UAE, July 12, 2018: Al Naboodah Construction Group (ANCG), a subsidiary of Al Naboodah Group Enterprises, one of the UAE's oldest and most respected family conglomerates, yesterday celebrated achieving five million man hours worked without a lost time accident at its landmark Dubai Creek Harbour site. ANCG is constructing two, 37-storey towers with residential units, penthouses and commercial units, plus external works and landscaping at Creekside Plot 18-A , residential project in the 6km2 Dubai Creek Harbour development by Emaar Properties. The landmark achievement was marked by a celebration involving all the workers. Several prizes were distributed including electrical goods with the top prize of a flat screen TV going to one lucky operative. Certificates of achievement were also handed out to personnel who were instrumental in training and supervising staff in order to keep HSE standards high. Overall works are on-track with the substructure and superstructure near completion. To date, a total of 70,000 cubic meters of concrete has been poured and 18,000 tonnes of steel used. Structurally, 33 of the 37 floors are complete and one apartment with total fit-out will be finalised this month, ready as a showroom. The entire project is due for completion in mid-2019.